I spent last weekend in icy, 20-below-freezing-Boston for PAX East. As is the norm for PAX events, I had an amazing time. What was unusual was the amount of games I actually was able to play. Usually I spend most of my time in queues for panels, but this year I magically spent more time on the show floor and actually getting hands-on time with some amazing games. All three of my favorite games from PAX East were developed and published by indies (short-hand for independent developers). I will always love and play my Halo, which I did, but these three really stood out as experiences I wanted to share. Time Machine is in development by Minority Media, the creative team behind Papo & Yo (which I mentioned in my ‘Must Play’ Games for Change list). The game is developed for the Occulus, the famously Kickstarted virtual reality headset, and set in the future – 2070 – where all war has stopped and the money that used to fund war is now channeled to science. You are tasked with traveling back in time to the age of the dinosaurs to “scan” them and collect data. Of course, the dinosaurs you are sent to scan are not the adorable herbivores of Land Before Time, but rather the aggressive, meat-loving kind of Jurassic Park. Or your nightmares. This game has everything my eight year old self ever dreamed about: virtual reality, time travel, and dinosaurs!!! This was my first time using the Occulus and after one go I am a believer. Sign me up! The opening scene of Time Machine is a vast, gorgeous skybox of snow-capped mountains, valleys, fields, and rivers. 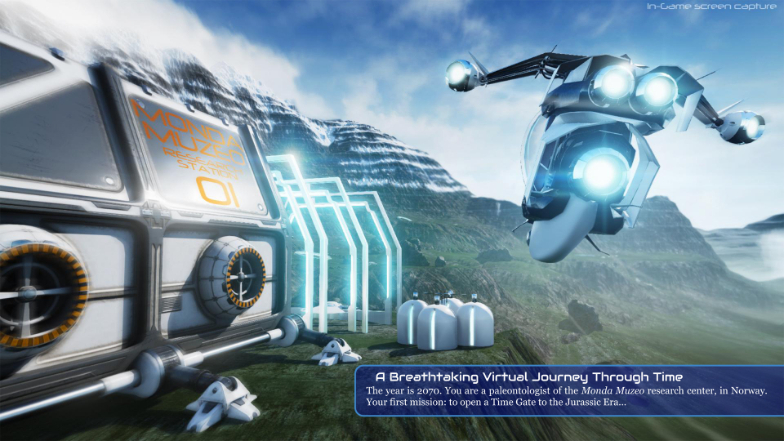 As the player, you are positioned in a hover-chair-like contraption that can navigate in all 3 dimensions. What’s crazy is when you physically look at your arm, you see an arm. When you look where your feet should be, there are a pair of legs and feet. At the urging of the developer, I took my float-chair as high up in the skybox as I could and experienced what I believe those in hot air balloons experience. Wonder. Then, the developed told me to look down, and I experienced my stomach plummeting and an overwhelming feeling of “HOLY CRAP!” I am not afraid of heights and I know I was firmly planted in my chair on the show floor of the Boston convention center, but my brain was momentarily convinced I was hundreds of feet in the air with nothing to stop me from becoming a gooey stain on an otherwise pristine mountainside. And that’s all before the dinosaurs. Teleported to the past, you emerge underwater. There are large crocodile-like animals which are your targets. Using your ability to slow down time allows you to get close enough to scan them. After completing this task, the dev asked I wanted to “see something bigger.” Of course! And so I swim off to a new area where the crocodile-dinosaur is now 30 feet long. The audio pings me to say there are 2 of these monsters in this bay, but I only see one. I float along, slow down time, and start to scan the one I can see, all the while my brain is playing Jaws music in my head. And then my screen starts to go red. I turn – physically turn because that is how you look around in the Occulus – and there is a massive, toothed, gaping maw devouring my face. The last part of Time Machine that really struck a cord with me was the little 5 year old who played the game before me. He rocked it. His father was right beside him, coaching him, and he was scanning ALL THE DINOSAURS. And yes, he scanned more dinosaurs than I did and no, he didn’t get eaten like I did. To be fair, they had turned off “aggressive” mode so the small child couldn’t get eaten. That soothed my wounded gamer pride just a bit. I so want the Occulus and other virtual reality tech to be readily available right now. I have this fantasy where I walk into an elementary school classroom and all the children are getting to explore the Jurassic period – the animals, the plants, the ecosystems – as if they were there. No more dry, boring text books. Games like Time Travel harness the innate curiosity and wonder of children and pair it with the fascinating, exciting, and crucial world of science. Games like this will be the catalysts for the next generation’s scientists. On a lighter note, I defused a bomb. Keep Talking is an Occulus game featuring asymmetrical gameplay (which, IMO, is the next big thing in gaming). One player has the Occulus and can see a virtual bomb case. The other player has the handbook on how to disarm the bomb. They must work together to disarm the weapon in five minutes or less. This is what puzzle games of the future look like. Cut the blue wire, but only if the top wire is black or white. Push the “disarm” button, but only if it’s shaped this way and this color, but not if it matches this serial number. This game is all about logic, reasoning, communication and cooperation. The fact that you’re disarming a bomb makes these things fun – you feel like an action hero! I proudly kept my note card with the “disarmed” stamp as an artifact of my accomplishment. Kitty in the Box takes the best of the internet and puts it into a mobile game. KitB is exactly what it sounds like, trying to get your kitty into the box. The kitties look like famous internet kitties Grumpy Cat, Maru, and even BatCat. The game was developed by Mokuni using Unity, which made me very excited because this is the kind of game I could actually be able to make! The game is simple but challenging and ridiculously cute. Some of my epic gameplay action. Sometimes changing the world starts with changing your mood, and it is really difficult not to smile and laugh when playing this game. And last but not least, I spoke on the panel Games Are Good For You. It was recorded and I will share it here once it goes through editing. Prev What if You Could Remember Everything?